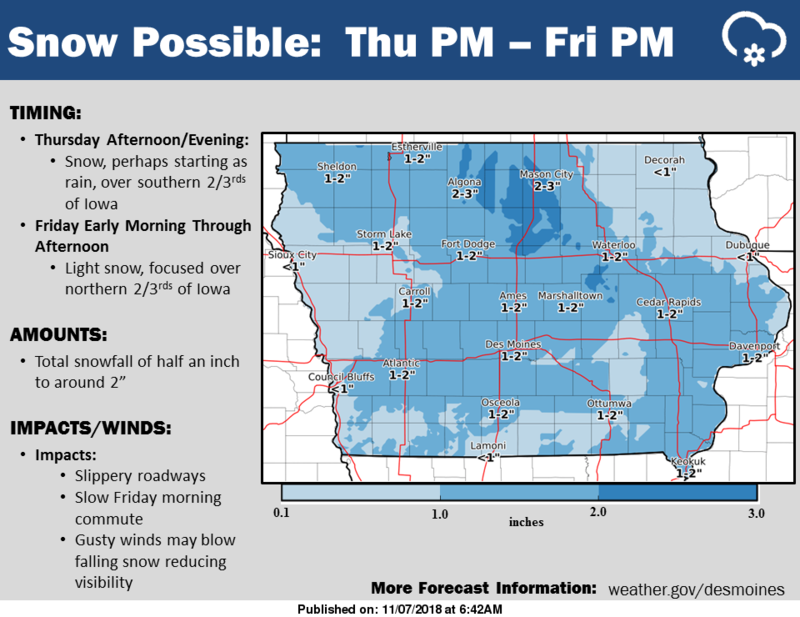 Snow Possible: Thursday Into Friday. There will be two separate rounds of wintry precipitation Thursday into Friday. The first round will have precipitation spreading into the southern two-thirds of the state Thursday afternoon and evening. The precipitation may begin as rain before transitioning to snow by Thursday evening and ending around midnight. The next round of snow will arrive over northern Iowa early Friday morning and slide southeastward into east central Iowa. Gusty winds will accompany this snow and cause blowing of the falling snow, which may reduce visibility. This snow may impact the Friday morning commute with slippery, snow covered roads. The highest snowfall amounts will be over northern Iowa where around 2 inches of snow may fall.